In the children’s book, Gwen the Rescue Hen, Gwen escapes from an egg laying hen house and finds her way to a boy named Mateo. Together they learn how extraordinary an ordinary chicken really is. Illustration from Gwen the Rescue Hen. 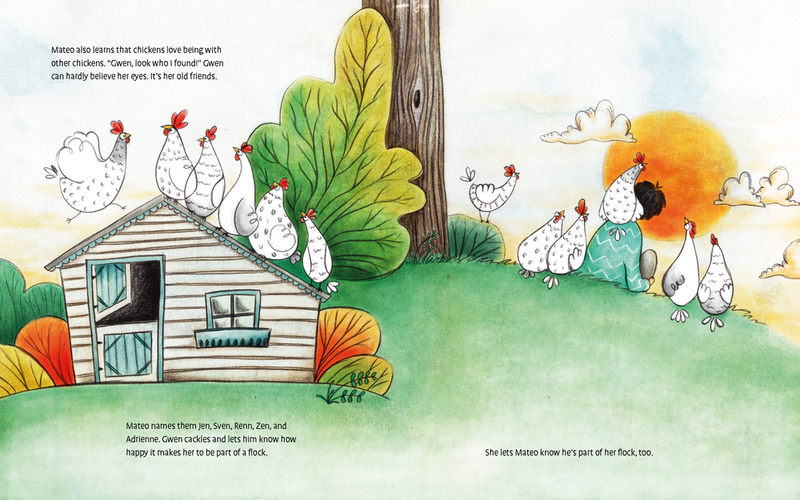 Gwen The Rescue Hen is on sale now on Stone Pier Press, Chelsea Green, Amazon, Barnes & Noble, and in bookstores. While you’re at it check out the companion book, Sprig the Rescue Pig, which is on sale on Amazon, Barnes & Noble, Chelsea Green, and Stone Pier Press.